It’s our last day of school, which means I’m now the proud mama of a first grader and a (holy crap!) 4th grader! That makes us all pretty old. Sniff. You might be seeing a new photograph in the header (and if you don’t, you can keep refreshing until you do see it). One of the headers is from the Central Park Rose Garden during the off-season, and I’ve been meaning to add one during the blooming season. Cute W took this new one with roses in bloom and the new fountain. Thanks, baby! Also thank you to my friend Brian who taught me how to add the header images in the first place, and made me such easy-to-follow instructions that I can add new ones without bugging him again. Speaking of excellent dads that I know, I meant to link to Steve McCurry’s photography blog again for his series on fathers in honor of Father’s Day, but I forgot. You can still appreciate fathers today, so go check it out. I’m recycling material, an edited-down version of an essay that I wrote about J’s recital last year for the now-defunct CBS 6 blog (accompanied by one of my favorite photos ever, taken by the delightful and talented Cute W). I’m hoping that enough of you are new and/or lazy about clicking links, so you haven’t seen it. Yes, I’m slacking off and using the extra time to pack and do laundry. Don’t judge me, okay!?! 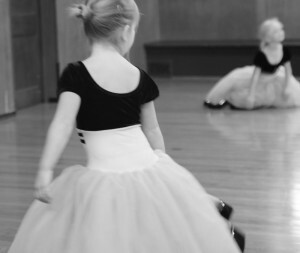 It’s recital season, and I predict crying. Luckily, it will be me, not my daughter. She takes classes at a large dance school with a marathon rehearsal, followed by a marathon recital, as its annual capstone. Last year was our first time. As one group of dancers, then the next, took the stage to rehearse, I realized that we were acquainted with someone in almost every group: neighbors, classmates, a former babysitter, girls from church. The effect was overwhelming. For each child, I’d search out the parent in the crowd and frequently find a familiar figure. Even the strangers, actually, seemed familiar: hands clasped, face rapt, jaw set in fear of a stumble, eyes filled with utter devotion. A few of my friends had been coming to this rehearsal every year for close to a decade. With books and snacks, they were more prepared than I was, and more relaxed. The grown-ups all chuckled knowingly at my daughter’s beginner class, uncertain and tentative as they crossed the stage to practice their bows, straining to keep hands clasped and their chain of dancers unbroken. All the parents were telescoping back to their own children’s early efforts—was that the year that they wore the yellow polka dots or the shiny blue? Remember how she cried all morning, and then onstage she never stopped smiling? I was stuck in my own time warp. The acts progressed, with older girls and more complicated choreography. Many classes included various stages of puberty, and tiny pixies skipped on the stage with muscular Amazons. And yet they all moved so gracefully, looking more alike than different, taking on a sort of archetypal image: today’s adolescent girl. Their steps were strong and sure-footed even as many solemn faces betrayed their deep concentration to avoid a misstep. It was mesmerizing. If my daughter continues, I will be sitting and watching every year for the foreseeable future. We’ll have a shelf of DVDs of each year’s recital, and watching them in a row will be like watching time-lapse photography showing flowers unfurling. I had seen other performances and recitals, even those with my own kids, that were a chore. But seeing all of these lovely dancers perform in succession made me recognize my preschool daughter, and even myself, as part of an unbroken chain. The choreography was wonderful, but the impression was so great because the most advanced dancers weren’t girls at all anymore, but fully grown-up young women. It was like a glimpse of the future. And it looks beautiful. What a beautiful post. It makes me feel as if I am at the recital, and I can only imagine the beauty of it when many years (or maybe not so many) down the road your daughters will read these words.